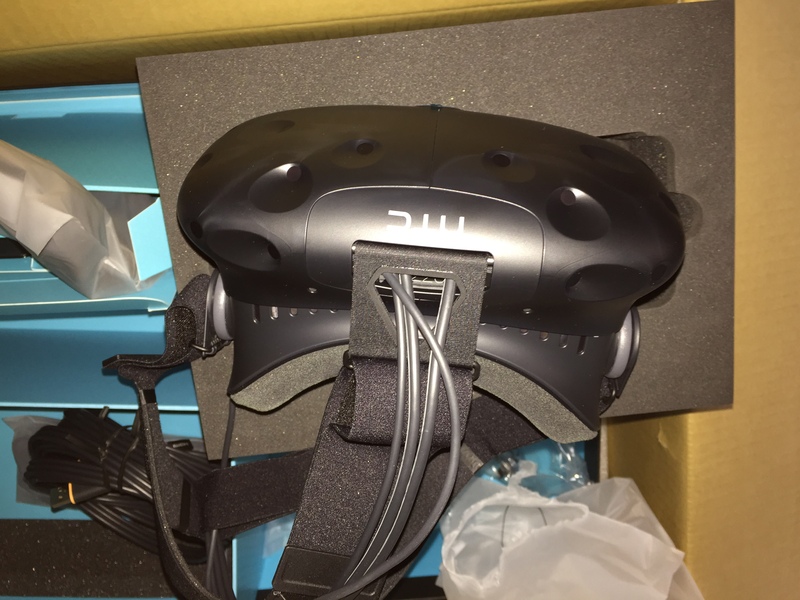 I got a Vive. 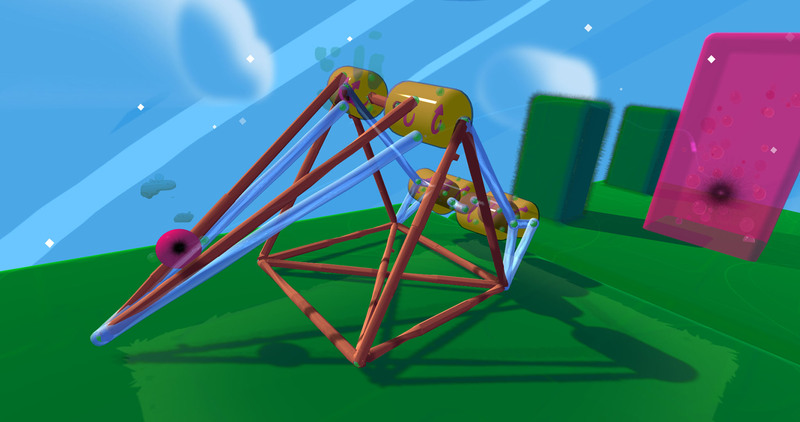 A real, working Virtual Reality system. That makes it officially The Future (hover-boards / flying cars / utopian government notwithstanding). I’ve been using it for a bit over a week and here are my my thoughts. Much joy! I’d been one of the earliest orders and I received mine about 10 days after they started shipping. 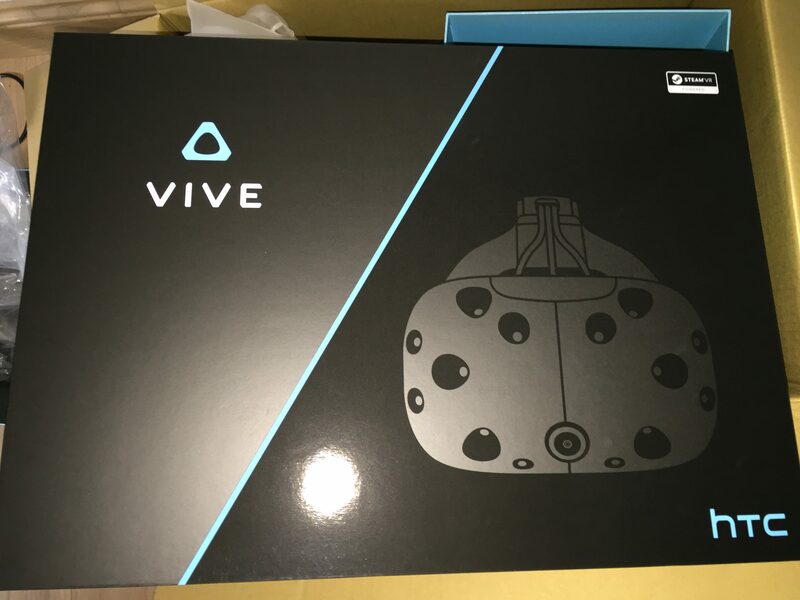 To say I was excited was a wee bit of an understatement; I’d been dreaming about proper VR since I was a boy and getting into adult Sci-Fi as I’d gotten older(Snow Crash! Neuromancer!) only made me more enthusiastic. And here it was! 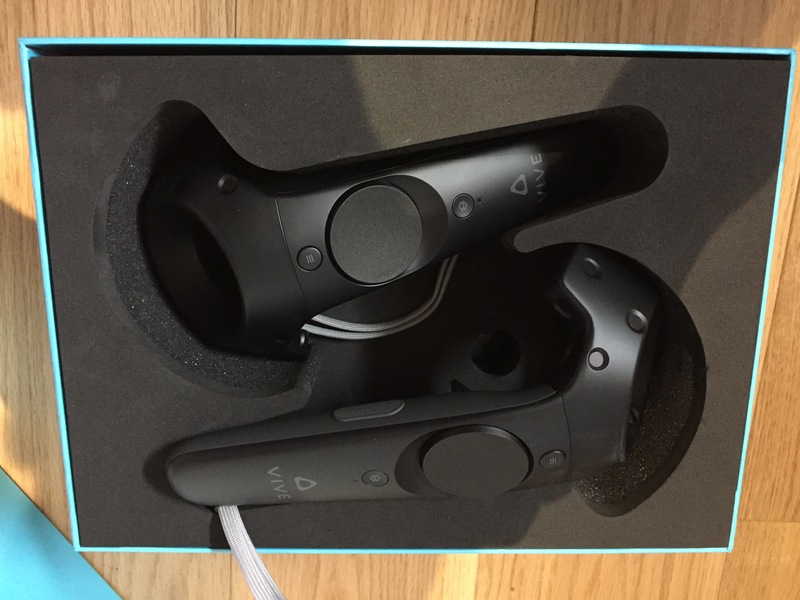 Not just seated VR but room-scale; allowing you walk around in VR, picking things up with the controllers, “feeling” objects with the haptic feedback. But would it live up to my (pretty sky-high) expectations? It all comes in a nice, big box. I like stuff that comes in huge packaging; I think it all comes from when I was a child and my brother’s pile of presents on Christmas was huge (massive plastic robots, massive plastic forts, massive plastic pieces of plastic) compared to my pile of minuscule presents (small books, small pieces of plastic with LEDs on them, small Spectrum cassettes). Everything is stored really nicely in sculpted foam. There’s a place for everything, and everything is in its place. Geek catnip. The headset. It has a 3.5 mm jack to plug in headphones (and comes with a set of good earbud style phones). Two controllers. Two wands with a trigger, grip sensor, haptic feedback, two buttons and a thumb trackpad. Supporting stuff. A smaller eye cushion for the headset. Two wall mounts for the lighthouses. An optional cable to connect the lighthouses. Cleaning cloth. There’s quite a bit to do but none of it was too challenging. It can take a bit of time though. The instructions are here if you want a look. Adjust the headset for comfort. I found the instructions about where to adjust the distance of the lenses from your eyes a bit ambiguous but the rest was pretty straight-forward. It can be fiddly adjusting the straps for the correct fit especially if you’re panicking about dropping the expensive piece of glass and silicon on the floor. Plug in the headset cable to the breakout box. A 3-in-1 multi-cable with HDMI, USB and Power connectors. After 20 years in IT and 10 years playing with computers before that I am reasonably qualified to plug three cables in without starting a fire. Plug in the breakout box to your PC. Just HDMI and USB to go from the box to your PC. Again, pretty straight forward. IN THEORY. In my case I had some problems here; my PC is tucked behind various bits of kit (monitor, printer, external hard-disk plus loads of other random stuff. There’s even a wooden Icelandic Horse there. I’m not kidding). The cables that go from the box to the PC are fairly short which caused a few issues as the back of my PC faces away from the front of the desk. Again, more fiddling to get it right. Get the controllers out and turn them on. Don’t destroy them. 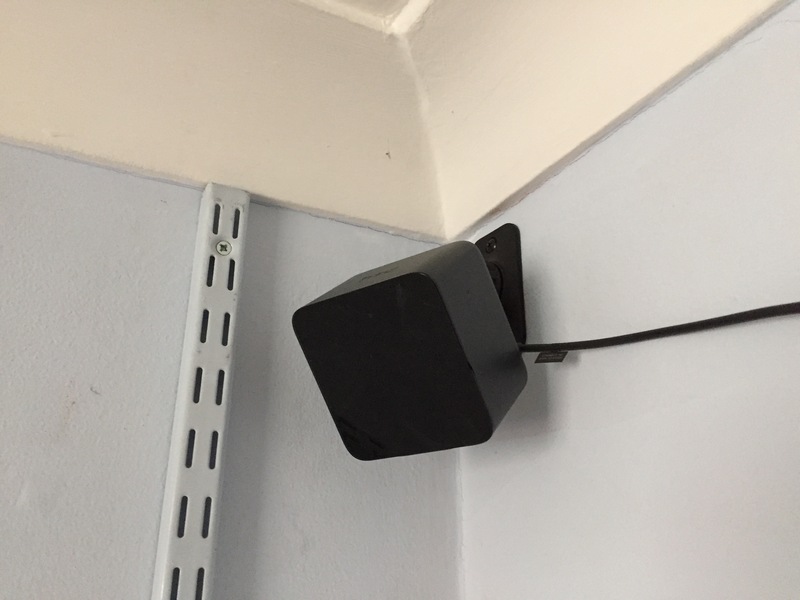 Initially I just put the stations up high on shelves near the room corners; this worked tolerably but there were a few ‘dead-spots’ in the room. In order to get a downwards angle you either need to use the wall-mounting brackets (included) or some kind of free-standing mount (not included). Wall mounting both would have been a massive task as I’d need to clear out most of my room to get access to one of the corners. Last you need to run through the software setup. This actually pretty fun as it’s animated with the little ‘Aperture Science’ people. This is where you set the usable area of your play space for room-scale games. You trace the perimeter of the room with one of the controllers and the setup does the rest. The chaperone system on the Vive uses this information to project a ‘wall’ in your ingame view when you get near a real wall. 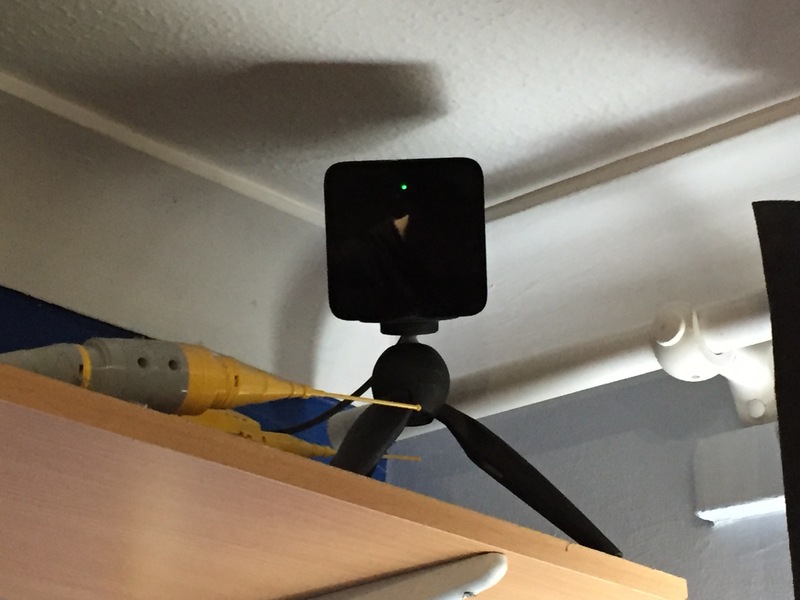 Additionally the Vive has an in-built camera so you can always have a peep into the real world to find something or make sure no one has quietly come into the room and is silently judging you. Once the setup program has finished, you’re good to go! Most of the way you control VR is done from within the VR environment but you can fire up the initial tutorial from the real world. 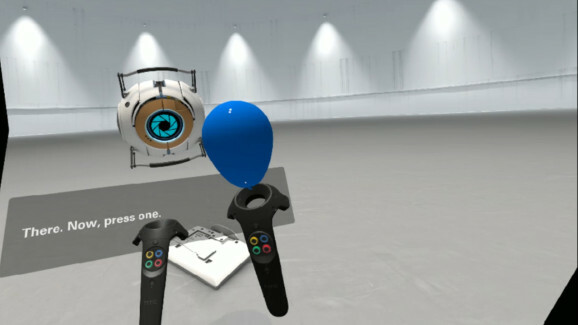 Cleverly, the tutorial pauses in VR, waiting for you to get the headset on and interact with it before it starts. This was it; I was “somewhere else”. The sense of actually being there is amazing and slightly odd; the controllers are rendered in the gameworld but obviously you’re not. So you see these disembodied wands responding perfectly to your movements. And stuff is talking to you! And you can press-buttons! And move! So here’s where my ability to review breaks down. There’s plenty of technical detail on the limitations of the technology; it’s lower-resolution than most gaming monitors (1080×1200 per eye), the FOV is naturally constrained (you’re looking through a headset), there’s loads of limitations about how you interact with stuff outside of VR from inside it (accessing your desktop) etc. But none of that matters because once you’re wearing it you’re THERE. It’s really hard to do it justice with text. Your brain fills in loads of missing bits of input which is quite weird; my wife said she though she felt the air move during one sequence and my daughter thought something touched her during another. Sitting on my ship in Elite, looking over my shoulder and seeing the entire bridge around me makes it a whole different experience. It really makes it my ship. There’s no nausea or eye tiredness. It works fine over my glasses. The headset wasn’t uncomfortable for the periods I used it for (up to about two hours at a stretch). Since getting it I’ve mostly played it daily. It hasn’t replaced ‘normal’ gaming but it’s supplemented it; it gives me experiences I wouldn’t normally be able to have. It’s also been lots of fun sharing it with the family and seeing what they do in VR; considering one of you is wearing a head-set and earphones it’s surprisingly social! Give it a try if you want or take the plunge if it’s something you’ve always imagined. It totally met my expectations which I was quite surprised about. Reblogged this on David Bishop Media.